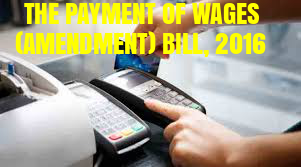 · The Payment of Wages (Amendment) Bill, 2016 was introduced in Lok Sabha on December 15, 2016 by the Minister of Labour and Employment, Mr. Bandaru Dattatreya. The Bill amends the Payment of Wages Act, 1936. · Method of payment of wages: Under the 1936 Act, all wages must be paid either in coin or currency notes, or both. However, the employer may pay his employee’s wages either by cheque or by crediting it into his bank account, after obtaining his written authorisation. · The Bill amends the 1936 Act to permit the employer to pay an employee’s wages: (i) in coin or currency notes; or (ii) by cheque; or (iii) by crediting them into his bank account. The Bill removes the requirement of obtaining written authorization for payment of wages by cheque or through a bank account. 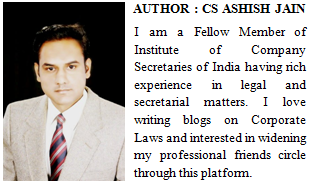 · However, the relevant central or state government may specify certain industrial or other establishments where the employer should pay his employees only by: (i) cheque; or (ii) crediting the wages in his bank account. "The Union Cabinet on 21/12/2016 approved the ordinance route to amend the Payment of Wages Act, 1936, to allow employers of certain industries to make payment through the electronic mode and cheques." further to amend the Payment of Wages Act, 1936. 1. (1) This Act may be called the Payment of Wages (Amendment) Act, 2016. Provided that the appropriate Government may, by notification in the Official Gazette, specify the industrial or other establishment, the employer of which shall pay to every person employed in such industrial or other establishment, the wages only by cheque or by crediting the wages in his bank account.". The Payment of Wages Act, 1936 (the Act) regulates the payment of wages of certain classes of employed persons. 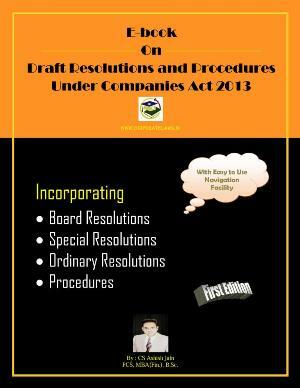 The Act was amended several times and last amended in the year 2005. Section 6 of the Act provides that all wages shall be paid in current coin or currency notes or in both. However, proviso to said section enables the employer to pay the wages to an employee either by cheque or by crediting the wages in his bank account after obtaining his written authorisation. 2. With the passage of time, technology has been changed and a large section of the employed persons have their bank accounts. The payment of wages through cheque or crediting it in the bank account of employed persons will reduce the complaints regarding non-payment or less payment of minimum wages, besides serving the objectives of digital and less cash economy. The State Governments of Andhra Pradesh, Uttrakhand, Punjab, Kerala and Haryana have already made provisions in the said Act for payment of wages to the employed persons either by cheque or by crediting the wages in their bank account, by making state amendments to the Act. 3. In view of the above, it has been decided to substitute section 6 of the Act so as to enable the employer to pay the wages to the employed person also by cheque or crediting it to their bank account and also to enable the appropriate Government to specify the industrial or other establishments, by notification in the Official Gazette, which shall pay to every employed person, the wages only by cheque or by crediting in his bank account.